An Parthenon usa nga templo ha butnga han Acropolis ha Atenas, Gresya. Amo ini an templo han Atenas ha harani 1000 tuig. Connelly, Joan B. (1 January 1996). "Parthenon and Parthenoi: A Mythological Interpretation of the Parthenon Frieze". American Journal of Archaeology 100 (1): 53–80. JSTOR 506297. doi:10.2307/506297. Freely, John (2004). Strolling Through Athens: Fourteen Unforgettable Walks through Europe's Oldest City (2 ed.). Tauris Parke Paperbacks. ISBN 9781850435952. Hurwit, Jeffrey M. (2005). "The Parthenon and the Temple of Zeus at Olympia". In Judith M. Barringer, Jeffrey M. Hurwit, Jerome Jordan Pollitt. Periklean Athens and Its Legacy: Problems and Perspectives. University of Texas Press. ISBN 0-292-70622-7. Tarbell, F.B. A History of Ancient Greek Art. online. 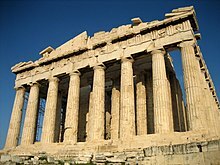 http://www.ellopos.net/elpenor/greek-texts/ancient-greece/history-of-ancient-greek-art-12.asp. "Greek Premier Says New Acropolis Museum to Boost Bid for Parthenon Sculptures". International Herald Tribune. 9 October 2006. http://www.iht.com/articles/ap/2006/10/09/europe/EU_GEN_Greece_Acropolis_Museum.php. Ginkúhà dida han 23 April 2007. "Parthenon". Online Etymology Dictionary. Ginkuhà 5 May 2007. "Talks Due on Elgin Marbles Return". BBC News. 21 April 2007. http://news.bbc.co.uk/2/hi/uk_news/6578661.stm. Ginkúhà dida han 23 April 2007. Ioanna Venieri. "Acropolis of Athens – History". Acropolis of Athens. Οδυσσεύς. Ginkuhà 4 May 2007. Nova – PBS. "Secrets of the Parthenon – History". Acropolis of Athens. PBS. Ginkuhà 14 October 2010. Holtzman, Bernard (2003) (ha French). L'Acropole d'Athènes : Monuments, Cultes et Histoire du sanctuaire d'Athèna Polias. Paris: Picard. ISBN 2-7084-0687-6. Ini nga pakli kataposan nga ginliwat dida han 03:53, 27 Enero 2015.